Carraig Donn beige Aran sweater, 100% pure virgin wool. A true style classic, this traditional inspired Aran sweater features a blend of traditional aran stitches and is finished in a crew neck style. A cold weather essential. This sweater size is generous, we advise you to take a size below the one you normally wear. Aran Woollen Mills (formerly known as Carraig Donn), located in County Mayo, West Ireland, draws inspiration from its truly unique environment to create the most amazing traditional and contemporary Irish knitwear in their Westport garment manufacturing factory. In 1965, the story started when Maura and Padraig Hughes created their factory, willing to preserve the irish knitting expertise and secure local employments. 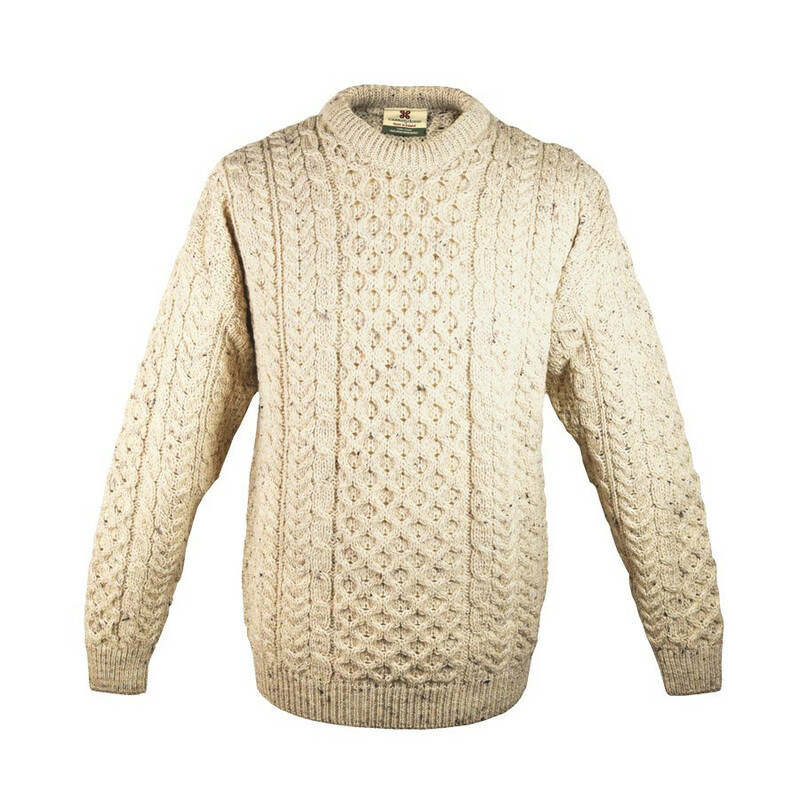 Aran Wollen Mills has been crafting Aran sweaters, traditionally worn by Irish fishermen. These sweaters originate from the Aran Islands, renowned for their beauty and natural environment, as well as for its rich cultural heritage. Drawing heavily from Celtic tradition, Aran Woollen Mills developed a passion for design and Irish craft, blending Irish heritage with contemporary designs. Using only the best natural yarns, Aran Woollen Mills knits Irish jumpers with traditional stitches, each one carrying its own unique meaning, a historic legacy from the Irish clans. The stitches reflected the lives of the islanders and their families, and were passed on one generation to the next. The Cable Stitch is a depiction of the fisherman's ropes, and represents a wish for a fruitful day at sea. The Diamond Stitch reflects the small fields of the islands. These diamonds are sometimes filled with Irish moss stitch, depicting the seaweed that was used to fertilise the barren fields and produce a good harvest. Hence the diamond stitch is a wish for success and wealth. The Zig Zag Stitch, a half diamond, is often used in the Aran Sweaters, and popularly represents the twisting cliff paths on the islands. The Tree of Life is one of the original stitches, and is unique to the earliest examples of the Aran knitwear. Knitwear was long to make, costly and made to last. It was used as working clothes and as a protection by fishermen against the relentless Atlantic Ocean and hard weather conditions. The woollen sweaters are water repellent, and keep the wearer warm even wet, as its insulating capacity due to the high volume of air in it helps protect from excessive cold and heat. Today, Aran Woollen Mills continues to offer the finest quality woollen Aran sweaters, combining knowledge of wool properties, design innovation and colourful creations. 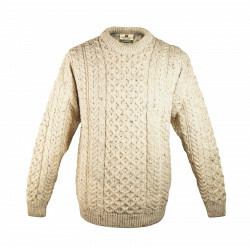 Aran Woollen Mills sweaters are recognized worldwide, and synonymous with the best Irish Knitwear has to offer. The traditional authentic Irish sweater, 100% pure new wool. A genuine, traditional Irish sweater made from 100% pure new wool. Natural colour. This sweater will keep you warm all winter long.